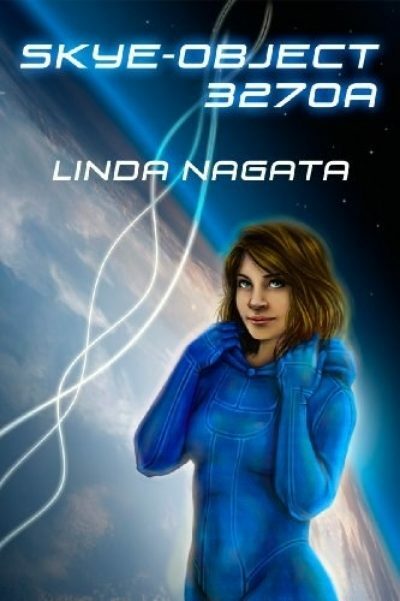 2010’s Skye-Object 3270a is a late addition to Nagata’s Nanotech Chronicles1. While it shares a setting with 1998’s Deception Well, this book can be read as a standalone. It is explicitly intended for a younger audience than Vast. Despite the “object” in her name, Skye-Object isn’t a what but a who, a young woman. Her odd name is a reminder of her history; she was found, as a toddler, in suspended animation in a starship’s lifeboat. The astronomer who first noticed it had tagged it as Sky Object 3270a. Skye’s rescuers were never able to determine the lifeboat’s origin or Skye’s original name. They were kind enough to give Skye a new home in the city of Silk. The rescuers can make an educated guess as to why Skye’s parents cast her into the deeps of space. Unfortunately, that guess is … incomplete. The city of Silk hangs hundreds of kilometers above the planet Deception Well, suspended on an orbital cable that reaches from the surface of the world up past geosynchronous orbit to the great counterweight. Deception Well is a world whose surface is rich in organisms, macro and micro, that are potentially lethal to humans. Of particular interest to the inhabitants of Silk are the Guardians, an ancient nanotech-based defense system intended to protect the world from its ancient enemies, the Chenzeme. The Chenzeme and the makers of the Guardians are long gone, but their mindless machines still war against each other. The most logical explanation for Skye’s origin is that her starfaring people had the bad luck to encounter a Chenzeme warship they couldn’t outrun. They must have tried to save Skye by freezing her and sending her out in a lifeboat, on the thousand-to-one chance that she would find a safe haven. Only two when she was frozen, Skye remembers nothing of her origins. Her lifeboat’s Dull Intelligence is mute. It would seem that Skye’s only hope of learning more about her history would be if other castaways were to turn up near the Deception Well system. And thus far, none have. Skye carries in her blood the proof that her rescuers have guessed wrong: an unseen, as yet unrealized threat that jeopardizes every single person in Silk. A threat whose cure may be found in a place where youths like Skye and her friends are not allowed to wander freely—the surface of the deadly world below, Deception Well. Note that the people of Silk define youth somewhat differently than we do. The citizens of Silk have been inoculated with nanotech Makers that greatly extend human lifespans. Some citizens are old enough to remember the system’s settlement, almost three centuries ago. Nobody under a hundred years old really counts as a full adult in the eyes of the larger community (as one teen bitterly remarks). This is one reason that the community is cautious and conservative. Another is that Silk is threatened by both overtly hostile Chenzeme war machines and the sometimes unintentionally hostile Guardian defenders. The city knows that extinction is always a possibility, because Silk is the second human settlement in the system. The previous human settlers discovered the lethal potential of the Guardians the hard way. This book would be a lot longer and slower if Skye and her friends stuck to the deliberate, careful pace the adults would prefer.I have to say that if I was one of the adults who has to clean up after the kids, especially after their foray into space, I would not be nearly as temperate in my reaction as these adults are but presumably their nanotech lets them dial their blood away from anger. Skye and her friends believe that their bold forays into the unknown are justified by the impending catastrophe. Their habit of charging off to save the world without bouncing their ideas off the adults first (on the entirely valid grounds that the adults would stop them) does not endear the kids to the authorities. It also results in a number of entirely avoidable brushes with death. Not only is it entirely believable that teens would do this, it makes for a fast-paced, entertaining narrative. Skye-Object 3270a is available from Mythic Press. 1: ISFDB’s ordering of the books in the Nanotech Chronicles seems … odd. Why do they count Tech Heaven as the 4th book? Although this book is a standalone that only happens to share a universe with four other books, I am going to arbitrarily tag this book the fifth in the series My review site won’t let me slot books into a universe without numbering them within a series as well.. Actually, I had a better idea while writing this: Deception Well, Vast and Skye-Object make a series and since Skye-Object is the third one published, I am going to number it the third one in that series. Go me! Bet I regret this decision when I review other Nanotech Chronicle novels.